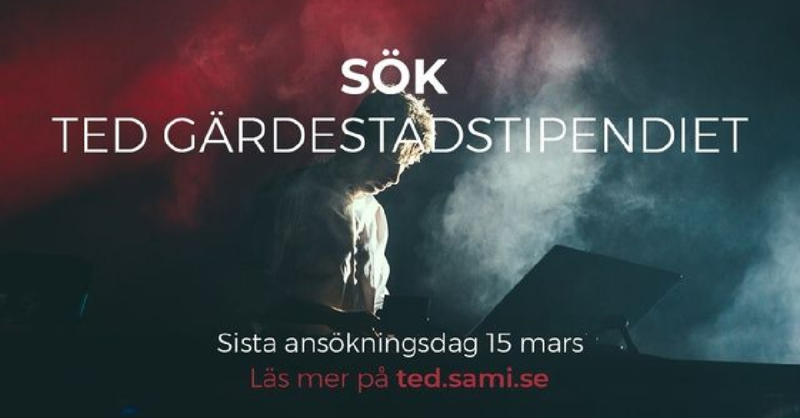 Sök TED – ansökan är öppen! Vet du någon som sitter på låtar som har något alldeles extra att förmedla? Någon under 25 år som bor i Sverige och skriver på svenska? Tipsa dem om att söka Ted Gärdestad-stipendiet. Stipendiet vill uppmärksamma, uppmuntra och stödja unga oetablerade sångare och låtskrivare inom vis- och populärmusik. Information och ansökan finns på ted.sami.se. Sista ansökningsdag: 15 mars. Du får det här mejlet som stipendieansvarig på musikutbildning. Sprid gärna informationen vidare till alla som kan vara intresserade. Kom förbi Erling-Persson Atriet nästa torsdag kl 19:30 för att få reda på vad det är. De Unges Konsert Young Soloists Competition 2019 is now open for applications. We invite young musicians to audition in Bergen. Since 1938, Bergen Philharmonic Orchestra has showcased young talent. This competition has been an important step in the careers of many top musicians such as Henning Kraggerud, Håvard Gimse, Tine Thing Helseth, Truls Mørk, Vilde Frang and Lise Davidsen. A total of five soloists will be selected from the audition round to play as soloists with Bergen Philharmonic Orchestra at De Unges Konsert in Grieghallen on Thursday 25 April 2019. The conductor is Cathrine Winnes. The concert will be live-streamed at BergenPhilLive.no. We cover all travel and accommodation expenses for soloists. All of the soloists receive a scholarship of NOK 75,000 from the Kavli Trust. The audience will vote for their favourite who will receive the Kavli Trust audience prize of NOK 20,000. Instrumentalists born in 1995 or later and singers born in 1992 or later are eligible to apply to audition for De Unges Konsert 2019. Everyone within this age group who is studying music in Norway, Sweden, Denmark and Finland, irrespective of nationality, can apply. Norwegian, Swedish, Danish and Finnish nationals can apply irrespective of where they are studying. The application form is at the bottom of this page. Auditions for De Unges Konsert will be held in Bergen on Friday 22 February 2019. To be considered for a place in the audition, you must submit the application form below by Friday 18 January 2019. The application form must contain a link to a video clip on YouTube of the repertoire you wish to perform at the audition and, if you are selected, at De Unges Konsert in April. The repertoire must not be less than 10 minutes and no more than 15 minutes. The recording must be from 2018 or 2019. It must only be of your repertoire, and it must be unedited. Live recordings and multiple-camera recordings are permitted. Please specify the place and time of the recording. Remember to use the setting ‘unlisted’ and not ‘private’ when you upload the video to YouTube. Invitations to attend auditions are sent out by 1 February 2019. Up to 15 applicants will be invited to audition after the pre-qualification round. Hotel accommodation in Bergen from 21 to 22 February will be covered for those invited to audition, and they will receive NOK 1,500 towards travel expenses. The audition repertoire is the same as the concert programme. The duration of the programme must not be less than 10 minutes and no more than 15 minutes. Musikkselskapet Harmonien will provide an accompanist for the audition. You can use your own pianist if you prefer, but we do not cover their travel and accommodation expenses. You are allowed to use sheet music at the audition and the concert. Any questions? Please contact project coordinator Sunniva Øiestad at sunniva@harmonien.no. De Unges Konsert is funded by the Kavli Trust.